It's very cold and rainy these days so I stayed at home and made these for my Tomato. One is this shirt. It closes with tapes and plastic snaps at the legs. I made it with Japanese cotton double gauze and also made these hankies with other gauze fabrics. I put cotton fabrics on the other side. The one of the blue has Nordic cotton which Ravenhill sent to me (* v *)!!!! I love the fabrics from her too much and can use them only little by little. I also made some simple hankies for Haru (* v *). So I made more for my shop. 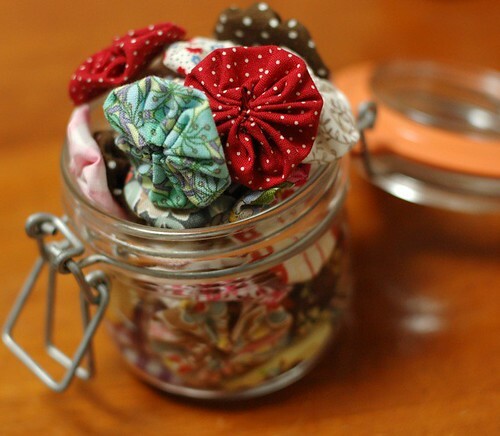 I'm thinking of making sets with small hankies using same fabrics. Now I put them in a jar and enjoy seeing them. 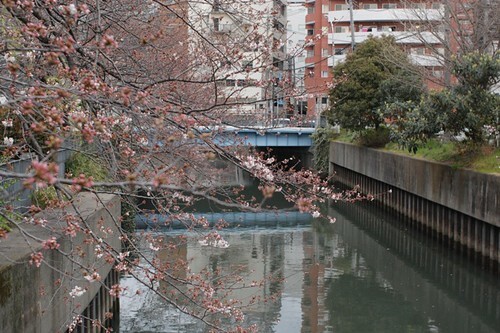 It's still cold today but I saw some cherry blossoms when I went to a supermarket today. I hope it gets warmer this weekend so we can go to see them. Oh, I'd like to tell you I don't put no more weights these days. I eat lots of vegetables, yogurt, fruits and beans and don't eat snacks and sweets. I take lots of rest (* v *)!!!! Hello, I just discovered you. Now im starting with sewing, its so dificult!ª!!! Hi Mai! I'm a big fan of you! I tried your Sarubobo tutorial and made one for my boyfriend, who likes it a lot! Thx! You're so generous in giving tutorials! Your lil tomato will look so cute in the shirt. Cant wait to see lil Tomato! Hi, those hairclips are lovely and i really like the shirt you made for your Tomato :) I wish i had made one for my son when i was pregnant. this post is so beautiful. i love the photos of the yo yos. your fabric is so beautiful!!! Good girl, eating well is important but don't forget to treat yourself every now and then, little Tomato will get that too :-) ! The shirt is so cute! Well done. Ohhh! Beautiful. Tomato is very lucky to have such a crafty mom. Do you know you can cover the snaps, so they look beautiful and don't scratch? I'll look for a link to send you later, I have it in my sewing book. Lovely picture of the cherry blossom. I love Tomato's shirt! The color is so good and the fabric also. I am first going to try your arm-cover and I will send you pictures of it. You cant take much antibiotic in pregnancy - so it is best to avoid cold/cough. Take Care mai! Love your work!! 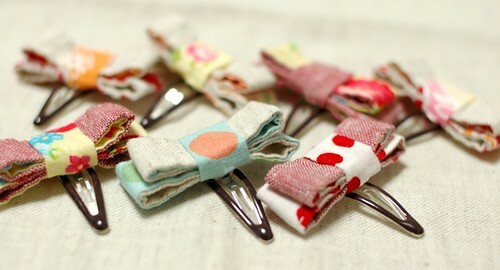 the hairclips are adorable, I am going to make some for my nieces. It's good that you get as much rest now as you can. Once little tomato comes you'll be living with less sleep. Of course, it's not as if you can save up the sleep for later ne? Oh well. Love your yo-yo's. Maybe you can make a little blanket for little tomato or make a diaper bag with it? The shirt you made is lovely! Your Tomato will be one well-dressed child having a mother with magic in her hands making clothes for him/her! Loooove the shirt! but specially those clips! I bet my girls will ask for few! Tomato's shirt is really beautiful, you are so talented! The yo-yos would be great on handbags, but I am sure you will come up with some fresh idea. Wonderfull what you made for Tomato. Have a nice wekend. Hello, I love your blog and I am also pregnant with my second girl, my other one is 17 months old. I just had a quick question...do you hand sew everything, or do you have a sewing machine also?? You are a fabulous sewer, I began sewing when I was pregnant with my first daughter Lacey. 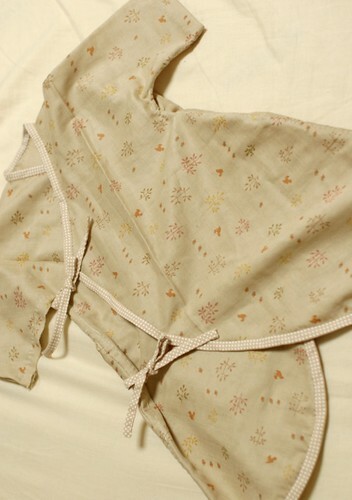 Mai, as always, your sewing is beautiful. 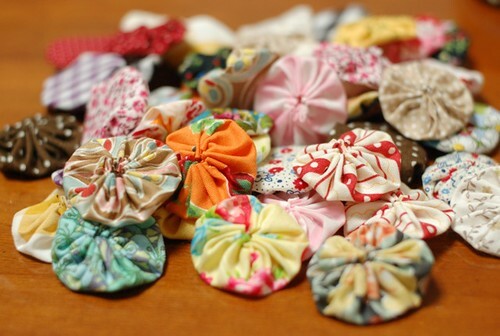 My grandmother and sisters used up bits of leftover fabrics to make yo-yos. I have a baby quilt made for me with a yo-yo top. And a full sized yo-yo top that I need to make into a quilt some day. Don't worry about your weight as long as you are eating healthy and resting! Tomato is one lucky baby! Hi Mai! I love everything you do ^_^ and the most wonderful thing about it is that every piece is made by your own hands..
That little shirt is adorable! Tomato is one lucky baby. That little shirt is so sweet. Lucky baby! I also like the materials you used for the hankies. Oh! Mai, Tomato will look sooooo cute in that outfit. Im a brazilian girl. I love so mutch your crafts. I've ideas for yo yo. Here, we calls its "fuxicos". My mail for envited you the pictures malu.cybertime@gmail.com. I love everything you make Mai, so beautiful and inspiring...off to sew now. Mai, You have been busy! 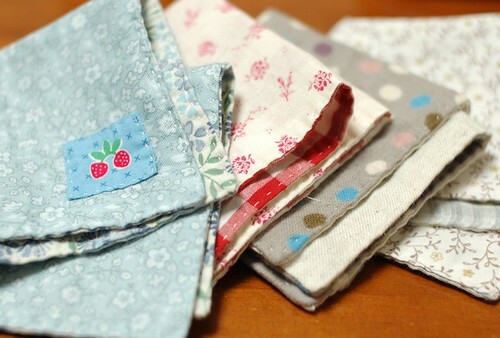 I adore the little stack of sweet hankies you have been making! They are so nicely decorated and such pretty colors. I wanted to let you know I received your wonderful package!!! Thank you for the excitement and the joy of the marvelous gifts you sent! I did a blog post about it. I was thinking that maybe Tomato will find the hair clips a bit too heavy but I don't know the size or the weight of the fabric, so can't say. How about using light satin ribbons instead? I am so inspired to create! Thank you!!! so pretty projects! I love the fabrics and the edging of the little coat. Mai, I really love the shirt for Tomato! Was it from a pattern, or an idea of your own? It's very very cute! Hi Mai! I really like the shirt you made for your little tomatoe - the shape of the legs reminds me of your sarubobo! Hope you're all well! I have to express my appreciation to the writer for bailing me out of such a challenge. After browsing through the internet and coming across advice that were not beneficial, I assumed my entire life was done. Being alive devoid of the answers to the difficulties you've fixed all through the article is a critical case, and ones that could have adversely affected my career if I had not come across the blog. That ability and kindness in controlling a lot of stuff was crucial. I'm not sure what I would've done if I had not come across such a point like this. I'm able to at this moment look ahead to my future. Thank you so much for the expert and amazing guide. I will not be reluctant to endorse the blog to any individual who desires assistance about this area.